The Blue Caterpillar Art Gallery at Butterflies for Africa in Pietermaritzburg is hosting an exhibition of woodcut prints by local artist Ezequiel Mabote who continues to attract both local and international buyers. On show are three framed pastel drawings and a wide selection of woodcut prints. These unique woodcut ‘prints’ take many years of experience and skill to master and each one is signed and numbered according to the number of works produced from one woodcut ‘block’. His choice of colour, design and subject matter is unique to each woodcut print artist. 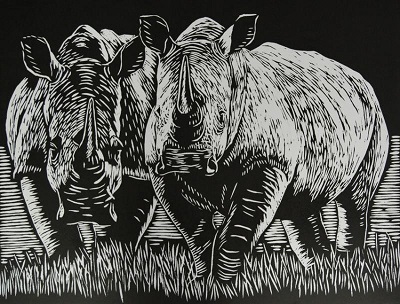 The plight of the rhino has also been highlighted in Mabote’s latest woodcut prints making them ideal for corporate gifts. He is a self-taught artist originally from Mozambique and first got his inspiration as a child from older boys who did woodcarving and fabric design in the neighbourhood. He learnt the basics of art at school but was forced to abandon these studies in order to find work to support his family. Later in life he got the opportunity to study fine art at the Nucleo de Arte in Maputo where he developed his skills in woodcut printing. The high degree of quality and professionalism in his work is testament to his talent and dedication to art. 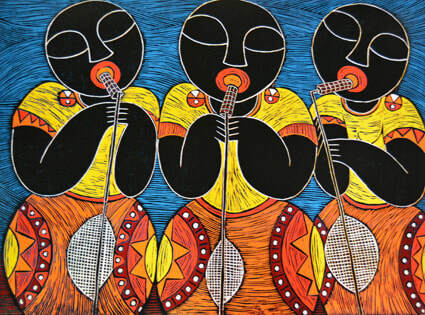 Mabote’s work has been exhibited in a number of galleries worldwide, including several exhibitions in New York and Chicago. The Blue Caterpillar Art Gallery is situated at Butterflies for Africa at 37 Willowton Road in Pietermaritzburg. For more information contact Jeni Cramer 033 387 1356 or visit www.butterflies.co.za for details of the gallery’s business hours.